The looming crosses are neon red, glowing softly in the chilly June air. We are strolling around the Hobart harbour but are compelled to stop and gaze upwards; I pull out my phone and take some pictures. They feel majestic, sinister, overpowering, beautiful. I bristle a little in their presence and say to Dave, “This feels like one big up-yours to Christianity”. “Christianity or Christendom?” he asks. Predictably, many Christians are offended by the giant red inverted crosses, which they take as a direct, council-endorsed assault on their faith. Many are signing a petition calling on Hobart’s Lord Mayor to have them removed. The inverted cross is a potent symbol, having been used at times to express anti-Christian sentiment. But there is no descriptive plaque that accompanies these red crosses. We are left wondering what it all means. 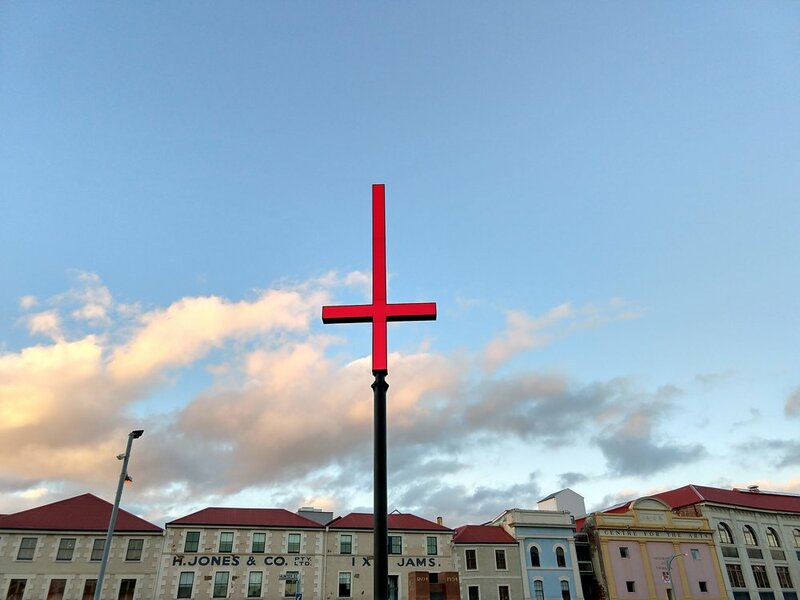 These crosses are part of Hobart’s Dark MoFo winter festival, and behind Dark MoFo is Mona, the Museum of Old and New Art. This big, brash gallery is the creation of gambling tycoon David Walsh. Mona aims to make people uncomfortable; to compel them to ask questions and to think. Mona, one might say, aims to offend. The institution is intentionally sacrilege, and is not particularly concerned with your religious sentimentality. Mona courts controversy because it can; because it is incredibly well-flushed in private dollars, and has become a hot and lucrative tourist destination for visitors to Tasmania. It occurred to me recently that the things that get under my skin about Mona – the bigness, the conceitedness, the way that people flock there and fork out money to be part of it – well, these are all things that could have been said of the church, at least at its high-water mark in the history of Christendom. The gallery is cathedral-like in proportions, and draws in pilgrims from around the world. We stand in its cavernous wings contemplating mysteries that are as evocative as they are elusive. We wonder what it all means. While Mona and everything it represents is all the rage, the traditional institutions of Christianity are increasingly seen as outdated and irrelevant. This, I believe, is the infuriating kernel that is irritating so many Christians, when they witness the public symbology of inverted crosses rising up and embracing the harbour of Hobart. The church, simply, has lost its position of power in modern Australian society and indeed most of the West: no longer do a majority of people look to it for meaning, for solace, for moral authority, for social connection. The corruption and abuse of the church and its institutions is now thoroughly in the public spotlight. People, overwhelmingly, are losing faith. The church exists on the edges of our modern society – which is rapidly moving on. People are looking in new places for the things they once received from the church. Yet the inverted cross holds another meaning. It is said that St Peter was crucified on an up-side-down cross, because he felt he was unworthy to die in the same way as his master. The inverted cross, then, is also a symbol of humility. In the ruins of Christendom, and in a time when people have lost faith and lost interest, humility is an appropriate stance for Christians to take. If not the church, where are people seeking deeper meaning? How can churches meet them authentically in that quest – in dialogue, not dogma? How can Christians be part of a genuine conversation about the key questions of our time, and contribute their resources and faithful narratives in a way that is helpful and enriching? And importantly, how will the church defy lies, hatred and arrogance, and stand for truth, love and humility instead? These are the questions that the church should be engaged in, rather than getting defensive about perceived attacks. It is from a marginal place that Christianity was birthed, on the edges of religious, economic and political power. The cross only became the universal symbol for Christianity after Constantine made it the dominant religion for the empire in the 4th century CE. Prior to that, Christianity existed furtively in the shadows, using discrete symbols made with sticks and dirt to display their faith, rather than crosses on large, publicly-funded buildings. Christianity found its existence in the margins of the dominant paradigm – and it seems that Christianity, after 17 centuries, has found its way back to that place again. If the church feels like it is dying, it is because in a sense it is. But if the Christian story teaches us anything, it is that death is the place from which new life springs. Owning its death as a power-holder and its new place on the margins will be the place from which the church will find relevance again. The important question for the church is not, “How can we stop ourselves from dying?” or “How can we stop people attacking us?” The question, rather, is, “How can we transform ourselves to bring deep healing to the world?” If the conversation, for the moment, is happening at the foot of an inverted cross, then that’s where the church needs to be, also.